The weather is changing, which means your clothes, skin care routine, and makeup should too. Take a peek inside my makeup bag this season and see what I bring with me on the go. When it comes to makeup, Fall and Winter scream moisturized lips, berry cheeks, and colorful eyes. During the warmer months, I don’t apply too much makeup, and that’s why I don’t hold back during the colder days. But you want to make sure you keep your skin moisturized too. Ever since I came back from my trip to New York, I brought back with me some pretty amazing products that I got from Revlon. Some of these have made it permanently into my makeup bag. I don’t carry much in my makeup bag and these products do not add bulk or weight. Filled in brows make a huge difference. Here is a before (left brow) and after (right brow) shot after using the Revlon ColorStay™ Brow Pencil. EYEBROW PENCIL: Every girl should have one of these inside her bag. Eyebrows shape your face and can help you look put together even on days you feel like you don’t. The one I’m using is the Revlon Color Stay™ Brow Pencil in shade Dark Brown. It has a spoolie brush on one end to groom your hairs in place prior to adding the waterproof formula on the other end. Then brush your hair again with the spoolie to blend and disperse the color. The precise angled tip helps guide you for an easier application. It’s literally the best tool in your purse. EYELINER: Eyeliner can instantly make you look alive. It just makes your eyes pop! A handy eyeliner to have in your purse is the Revlon ColorStay 2 in 1 Angled Kajal™ Liner; you can apply it traditionally on your lash line or even use it as an eye shadow. The Kajal™ Liner features one end of the eyeliner for a precise application and an angled tip brush applicator to smudge the liner for a smoky, sultry look. The Kajal formula is easier to blend and lasts longer too. I used the shade Fig on my waterline as well as eyeliner for a cut-crease look. EYE SHADOW: When you are on the go and rushing to get ready in your car (it happens to me from time to time), it is a good idea to have a crème shadow ready with you. They are much easier to blend on your skin than traditional eye shadow powders and last longer. I would recommend keeping a neutral shade with you in your makeup bag. On my eyes I have two different shades. 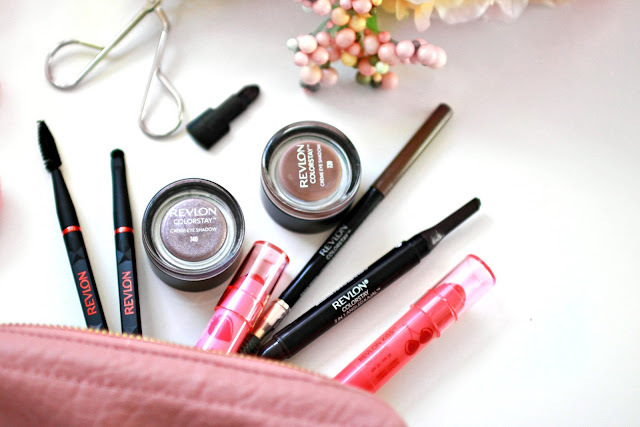 These are the Revlon ColorStay™ Crème Eye Shadows in shades Black Currant and Chocolate. You can easily blend them together for various looks. Revlon just came out with these and I am beyond impressed with the quality and texture. It even comes with a brush on the cap. No more messy fingers! LIP BALM: Some of the worst daily pain during the winter can be chapped lips. Mine get pretty dry, and now that I have braces, they get worse. I always make sure to carry a lip moisturizer with me. I recently discovered the Revlon Kiss™ Balm in Sweet Cherry. It’s the best of both worlds, hydrating and it has a nice tint of red. The hint of color means I now don’t look like a zombie. Another plus is that it has SPF 20 and smells super yummy. What is inside your makeup bag? What is the one makeup product you can’t leave your house without? I’m always interested in what others have inside their bag too. This post is sponsored by Revlon through their partnership with POPSUGAR Select. While I was compensated to write about Revlon, all thoughts and opinions expressed are my own. I so loved your makeup kit! You only have few products on you kit, but are all definitely useful and flexible. This review will definitely make it on Christmas writing discount at SmartPaperHelp makeup review section. Although not really tattoos, henna design tattoos are healthy, pain-free alternatives that are popular for special occasions. The designs for Mehndi originated in India where bride Simple mehndi design for left hand were used on the bride's hands. Today, simple designs of Mehndi can be used for all kinds of special occasions without the permanent results of a tattoo.